The Monday Club SLO - Sip, Sample and Sinatra! End your work week at The Monday Club of San Luis Obispo for the Third Annual Sip, Sample and Sinatra! Sip award winning local wines and sample delicious central coast food while listening to classic Sinatra tunes performed by Steve McAndrew and Band. Peruse and bid on fabulous silent auction items that include jewelry, home decor items, objects for your favorite oenophile, and gift certificates to the best SLO restaurants, spas and shops! 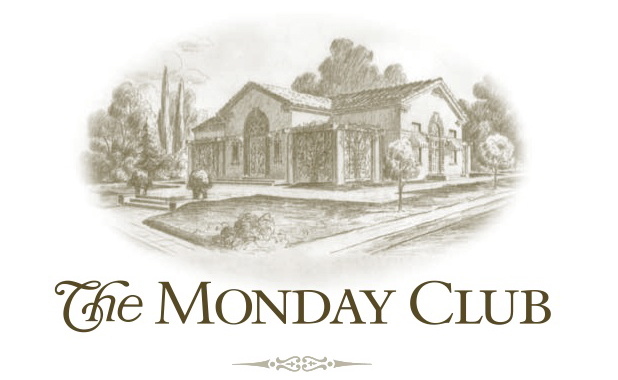 Be dazzled by the Live Auction for A Chef Catered dinner for 12 at The Monday Club....A weekend away at the Julia Morgan designed Club Residence at Fort Hunter Liggett. Wineries participating this year include Tolosa Winery, Filipponi Ranch Cellars, Mollydooker Wines, Sinor-LaVallee Wines, Stephen Ross Wine Cellars and Talley Vineyards. Cal Poly Wines will also be pouring! This event benefits the upkeep of our historic building and grounds. Tickets are $35 in advance, $40 at the door. They can be purchased from Debbie Collins at 441-2654 or by contacting a member. Tickets are now available at Brown Paper Tickets. See you there!